Join us every Thursday, June – September, from 3 – 7 p.m. to shop at the Wolf River Market! 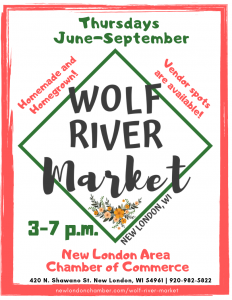 The Market is located in the Chamber office parking at 420 N. Shawano St, New London. Vendors will be set up in the parking lot toward the N. Shawano Street with plenty of parking for your convenience. We’ve invited a variety of vendors to set up throughout the summer to accommodate your needs.